Modern, Effective, Proven. 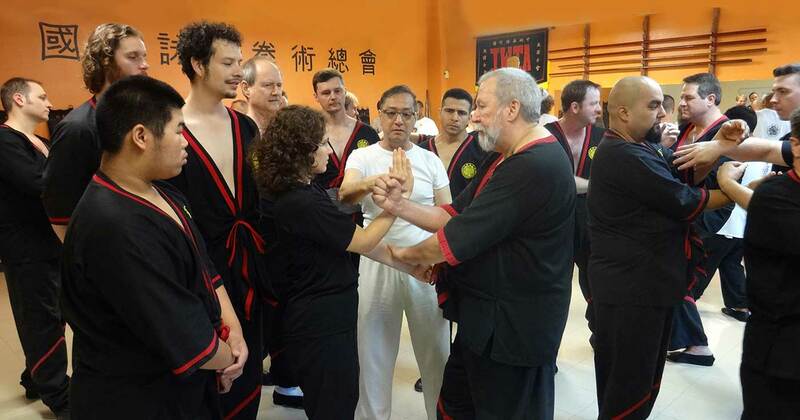 Leung Ting WingTsun® kung fu is the modern-day self-defense system developed by Great Grandmaster Professor Leung Ting and taught worldwide by affiliates of the International WingTsun™ Association, which spans 64 countries of the world. Regardless of your size, strength, gender or athleticism, WingTsun™ kung fu is self-defense that will work for you. In our classes, you will strengthen your body and mind while you learn a highly effective method of personal defense. WingTsun™ kung fu is unique – a modern system based on physics, human anatomy and biomechanics. With the WingTsun™ system, you will learn to defend against larger and stronger attackers using simple, direct, and effective techniques. WingTsun™ kung fu is THE cutting edge system for personal defense. WingTsun™ kung fu is passive in defense and advocates attack only in response to an opponent’s attack. The underlying principles of the martial art are the same as it’s underlying philosophy. WingTsun™ kung fu seeks to provide balance. Students are taught as a group, yet guided individually. The class environment is friendly and family-oriented. Forms Training – which teaches concentration, mental focus and precision of body movement. Chi-Sau – a training exercise unique to WingTsun™ kung fu, which uses tactile reflex development and muscle memory to “program” the limbs how to react to contact with an opponent’s attack. Lat-Sau- free-fighting training, where the student learns to use the movements of the forms and the chi-sau program for either sparring or actual fighting. Strength Training – to build and improve one’s strength and power. Students use a variety of training equipment such as kicking shields, focus mitts, heavy bags, wallbags, suspended spring, the wooden dummy, and tripodal dummy to improve their strength, flexibility, coordination, focus and timing. Complimentary Exercises – to build and improve one’s skill, flexibility, coordination, focus and timing using additional WingTsun™ kung fu training drills. Wooden Dummy Techniques – the most advanced empty hand form of Leung Ting WingTsun®, practiced on a wooden dummy. Weapons – training in the Six-and-a-Half-Point Long Pole (Luk-Dim-Boon Kwun) techniques and the Eight-Cutting Broadswords(Bart-Cham-Dao) techniques of Leung Ting WingTsun®. Leung Ting WingTsun® kung fu is practiced by nearly one million people worldwide, under the auspices of the International WingTsun Association. With over 40 years of research and investigation, Great Grandmaster Professor Leung Ting has taken the original teachings of the late Grandmaster Yip Man (Ip Man) and merged them with modern training methods plus his experience in training ordinary people, police officers, military personnel, tournament fighters, and movie stars — producing the unique Leung Ting WingTsun® training system.